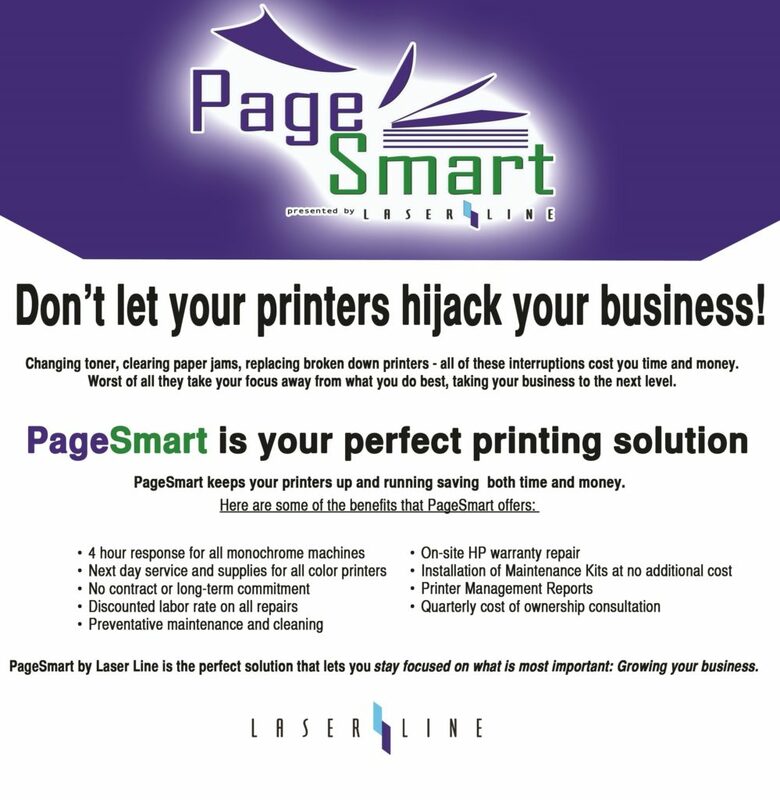 PageSmart by Laser Line is the fast track to take you to printer freedom! Since 1989, Laser Line has developed tried and true methods to manage all your printing needs. To put it bluntly, Laser Line has been a trail blazer in managed print services and we believe our methods are the very best. PageSmart evolved from our flagship print management Gold program. Is your business in print chaos? Is your supplies closet stacked with outdated supplies for printers and copiers you no longer own or use? Are your employees purchasing toner on the fly from big box stores? Would you like to be able to budget your printing costs? Are you able to measure the amount of toner your company is using? Are your business machines the right fit for your print demand? Are some machines barely utilized while others are overworked and frequently breaking down? Are you looking for a solution that will NOT cost you more and will help you get a handle on your printing costs? This Laser Line Service Program provides you with cost effective print management for your laser printers and is the foundation of what promises to be a long and lasting business relationship. Install supplies free at time of delivery. Controlling inventory costs. Perform Preventative Maintenance each time machine serviced. Quick 4 hour (or less) response to calls for monochrome printers. Free labor for installation of Maintenance Kit at manufacturer’s interval. Service call free when no parts needed on monochrome machines. Monochrome laser printer service performed at $89 flat rate plus parts. Color laser printer service performed at $99 hour plus parts. Monthly Printer Management Reports available on request. Use Laser Line toner services for all your printer related supplies. Printers will utilize Laser Line supplied consumables. Call or e-mail Laser Line when you have a printer related problem or print quality issue. Remember… printers are meant to help you do your job, not be your job. It’s simple. It’s Print Management. Just let go!